One of the most fundamental challenges that a cell faces is how to bring membranes that are far apart, close together. Like a dripping faucet, where the droplet is not freed until the two outer edges of the stream meet, that critical step is essential for diverse undertakings: from separating two cells as they divide, to liberating infectious viruses from host cells. New research shows how cellular machinery, called ESCRT (Endosomal Sorting Complexes Required for Transport), accomplishes this essential task. The collaborative effort co-led by Wesley Sundquist, Ph.D., at the University of Utah School of Medicine, Adam Frost, M.D., Ph.D., at the University of California, San Francisco and University of Utah School of Medicine, and Phyllis Hanson, M.D., Ph.D., at Washington University, was published in Science online on December 3, 2015. The core ESCRT machinery was caught in the act using a combination of innovative electron microscopy (EM) imaging technologies, including cryo-EM which takes pictures of flash frozen proteins at atomic-level detail. The images illustrate how the ESCRT machinery forms coils, and how those coils can draw membranes together. The white arrows below point to membranes surrounded by the bumpy ridges of ESCRT protein as it brings two sides of a bulbous vesicle together by narrowing it into a tube. The yellow arrows point to regions of the membrane that are free of the machinery. Images captured at an ultra-high resolution of 4Å (an angstrom is a ten-billionth of a meter) reveal that the core machinery is essentially a coil that wraps around membranes. In this movie, the ESCRT machinery­ is colored green. 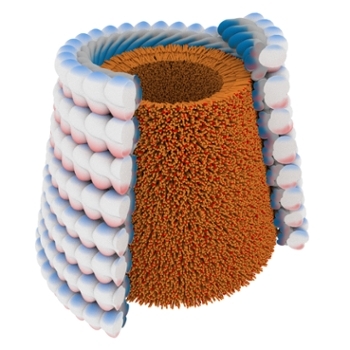 This graphic illustrates that the coil is made of multiple copies of ESCRT proteins (light colored balls) that stack into coils as they surround the outer edges of a membrane (brown). Two components of ESCRT, IST1 and CHMP1B, make the coil by joining together, with IST1 on the outside, and CHMP1B on the inside. CHMP1B drives assembly of the coil, an accomplishment made possible by its flexible arm-like shape. Each CHMP1B subunit grabs and interlocks with adjacent subunits, strengthening the overall machinery. Resembling a molecular noose, these coils wrap around the outsides of membranes and pinch them together. Once nature arrives on a good solution, evolution tends to tinker, often expanding its use in the process. Experiments show that ESCRT coils formed by a different but related subunit, called CHMP4A, can perform the task in a slightly modified way: it sits within two membranes and pulls them together. This research explains how the ESCRT machinery forms coils, and suggests ways in which these coils can tubulate membranes as cells divide, repair themselves, produce viruses and create transport vesicles. It’s possible that understanding ESCRT could one day lead to new preventions for viral infections, or treatments for certain neurodegenerative diseases. But for this study’s lead researchers, satisfaction comes from bringing the unseen to life. In addition to Sundquist, Frost, and Hanson, the co-authors are: John McCullough (co-first author), Marissa Saunders and Leremy Colf from the University of Utah, Amy Clippinger (co-first author), Michael Skowyra, and Teresa Naismith from Washington University, Nathaniel Talledge from the University of California, San Francisco, Pavel Afonine from the Lawrence Berkeley National Laboratory, and Christopher Arthur from FEI Company.